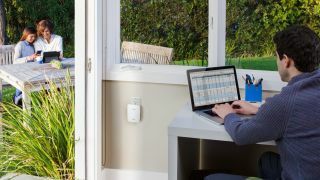 It can be really annoying when your home office or your favourite seat in the lounge just happens to be in a blind spot for internet connection. There is nothing worse than your favourite show buffering every two seconds or that all-important message not sending. But this doesn’t necessarily mean that there is something wrong with your connection, it just means that you might need to give your connection a boost, especially in larger homes. This isn’t just a problem in large homes though; your network range can sometimes be affected by the walls or doors in the home even if you’re only in the next room from your router. If you think this is an issue you are having, then the fastest way to rectify it is with a Wi-Fi extender. This little device enables you to boost your Wi-Fi signal throughout the home by taking the signal and repeating it across the home into the area where you have little to no coverage. A Wi-Fi extender can be great for those who want their internet connection to reach multiple floors or even out into the back garden. AC routers are known for their speed, as opposed to N rated routers, so if the router you have currently got isn’t AC rated, you may want to consider changing that before investing in a Wi-Fi extender. In addition to that, most Wi-Fi extenders these days will be dual-band, and these are able to support both 2.4GHz bands and 5GHz bands with a speed anywhere up to 1200mbps, which is much more efficient in supporting a number of devices in the home. If you’ve only got a slight dip in your network strength you want to patch up, then a Wi-Fi extender doesn’t have to cost as a fortune. You can get one for around £40, but if you find that your Wi-Fi is not reaching at all to a certain part of your house, then a higher performing Wi-Fi extender with a quicker data transfer speed that can double or even triple the range of your network can set you back up to £100. We’ve rounded up the best Wi-Fi extenders on the market right now, and summarised their features so you can pick the right one for your home. Take a look below to find out more. If you work from home, then this high-performance Wi-Fi extender is a worthwhile investment that will ensure you never lose coverage. This is a dual band extender which is designed to boost your network up to 10,000 square feet, which is ideal if you have a large home or want your Wi-Fi to extend into your back garden. Users have found this device to be useful, but a little bit tricky to initially set up. You’ll need to have a decent AC router to begin with to really make the most of this Wi-Fi extender, but once you’ve set it up, you can even set it to target specific devices if you need to have a guaranteed seamless connection, ideal for when you’re in the middle of downloading something. This Wi-Fi extender has a fast connection that is said to be excellent for eliminating dead spots in the home. Users have said it’s very simple to set up, and although it might not travel as far as the TP-LINK extender, it does provide seamless connectivity to that annoying area where you just can’t seem to get connectivity. So if you often use your games console in your bedroom but find it frustrating when your internet connection dips, this Wi-Fi extender can be a life saver. The only complaints some users had about this extender is that their support team can be a little slow to respond with any queries, but for the most part this universal Wi-Fi extender was said to work smoothly with no issues. Gamers in particular found this Wi-Fi extender to be an excellent way to ensure they have a strong and fast connection at all times. Particularly good for PCs and consoles, this extender works as an adapter that you can plug in to the wall of the room you want to boost your connectivity in, and they have integrated sockets which means you don’t lose a power outlet. However, one thing to note is that sometimes there can be interference with the connection if you use the power outlet for something, such as a vacuum cleaner, but the network is always restored to full when this is disconnected. What’s also great about this Wi-Fi extender is that you can always add more adapters throughout the home to boost your connectivity to more devices when needed. Large households who struggle to get their connection to reach into every room of the house can expect wide and even coverage from this Netgear box that has antennas to maximise not only the range of your connection but also the accuracy. This is a compact and smart looking box compared to some of the other Wi-Fi extenders on the market, so it won’t become an eyesore in your home, and this little box has a lot of power in it, with some saying it can extend their Wi-Fi all the way into their back garden. This Wi-Fi extender isn’t too costly either, so users definitely found it to be a worthwhile investment. If you don’t like the idea of having to faff around with connection networks and IP addresses, then you’ll be pleased to hear that this Wi-Fi extender is incredibly easy to set up with a simple push button connect that can be done from your smartphone, tablet or laptop. Even those who say they’re not very tech savvy found it very easy to get this extender up and running with no problems. If you need to ensure you don’t lose connectivity during a download or if you’re streaming a movie or gaming, then you can use the beamforming function to focus the Wi-Fi on one device for uninterrupted connection. If you do use this function, you may need to give the box a reboot after as some users found it can get a little hot. Those who have the D-Link Wi-Fi extender have been pleasantly surprised by its strength, especially travelling through many rooms in the house to find the blind spot. It is said to give good and even coverage across two storeys and users found it to work continuously with no regular re-boot issues that some Wi-Fi extenders can have. Setup is easy; simply plug in the device and use the WPS button to sync to your router, or download the app on your smartphone for quick one-touch connectivity. This Wi-Fi extender has had glowing reviews from users who just needed a little boost in their home for that annoying blind spot. This is technically the least powerful device on our list, but if you’ve only got a small home and don’t use too many devices, you can expect this Wi-Fi extender to do exactly as intended. This device is plug and play, making it easy to use, and the smart indicator light on the front makes it easy to know whether the placement of your Wi-Fi extender is conducive to getting the best connection. Those who did have niggles have said that the company's UK customer support team is available 24/7 and provides excellent service.